In ancient geography, Cappadocia / Capadocia, or Kappadokia / Kapadokya Turkish (from Persian: Katpatuka meaning "the land of beautiful horses", Greek: Καππαδοκία / Kappadokía) was the name of the extensive inland district of Asia Minor (modern Turkey). The name continued to be used in western sources and in the Christian tradition throughout history and is still widely used as an international tourism concept to define a region of exceptional natural wonders characterized by fairy chimneys and a unique historical and cultural heritage. The term, as used in tourism, roughly corresponds to present-day Nevşehir Province of Turkey. It is impossible to define Cappadocia's limits with any real accuracy. In the time of Herodotus, the Cappadocians are supposed to have occupied the whole region from Mount Taurus to the vicinity of the Euxine (Black Sea). Cappadocia, in this sense, was bounded in the south by the chain of Mount Taurus, to the east by the Euphrates, to the north by Pontus, and to the west vaguely by the great salt lake, Lake Tuz, in Central Anatolia. But Strabo, the only ancient author who gives any circumstantial account of the country, greatly exaggerated its dimensions. 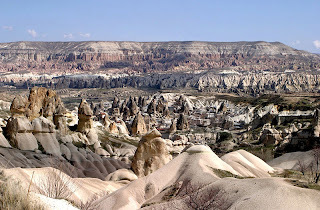 It is now believed that 400 km east-west by 200 km north-south is a more realistic appraisal of Cappadocia's extension.